Many seniors go through major life changes that could make them more vulnerable to depression. But it’s heartbreaking to stand by and watch someone deal with depression or loneliness on their own. Zara Lewis shares 10 ways you can help your older adult cope with symptoms and work toward recovery. According to WHO estimates, depression affects about 350 million people of all ages worldwide. While coping with depression is tough, it’s even more difficult to watch an aging family member struggle with it. As my depressed mother-in-law’s caregiver, I’ve come up with a list of tips I wish to share with other caregivers to make it easier for them to help their older adult deal with isolation and depression. 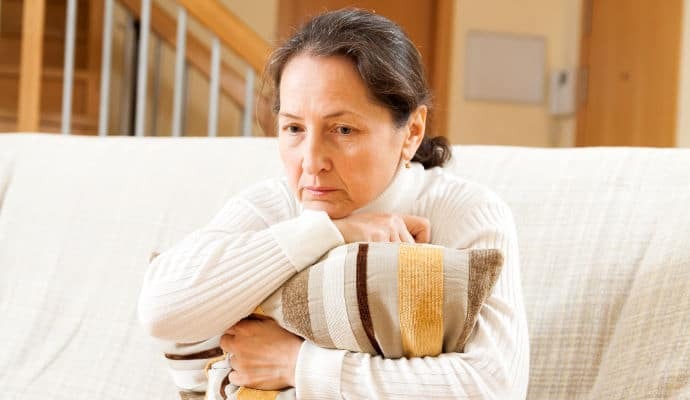 Many seniors who live alone are prone to sleeping problems which can aggravate depression. To prevent serious depressive episodes, see to it that the older adult keeps a regular sleep schedule and doesn’t take daytime naps. If the person suffers from sundowning or sleep disorder, keep engaging activities or necessary medication close at hand. Struggle with depression is much tougher for people who’ve lost their sense of purpose in life. To keep loneliness and brooding at bay, encourage the senior to take up a hobby such as knitting or gardening. You can also talk them into trying social pastime activities such as card playing, yoga, or volunteer work for a local charity. Don’t let your loved one deal with depression on their own: encourage them to visit friends and extended family, take part in group outings, and attend community events. Studies suggest that an active social life improves physical, mental, and emotional health, which are especially important for the elderly struggling with loneliness and depression. Research found that physical activity can be a lifesaver for aging persons. Gentle exercises such as walking, stair climbing, and age-appropriate workouts can help a senior stay in solid physical, mental, and emotional shape. You can also encourage the depressed person to sign up for a group exercise class like yoga or tai chi – they might even make friends with like-minded peers. Dealing with an aging person’s depression is easier if you know what foods to serve them. Fiber-rich food such as fruit and vegetables are a must for seniors, and so are whole grains and lean protein. Serve vegetables lightly cooked, and minimize sugar, starch, and unhealthy fats. Seniors who live alone often get caught up in a whirlwind of negative thinking. It would be great if you could entrust them with a meaningful responsibility. For mobile seniors, a dog will make a perfect companion that will make them feel loved and needed, keep them physically active, and serve as a social lubricant. I’ve found caring for a plant can also be a potent mood-booster: my mother-in-law’s depression has improved since I bought her a moringa tree to look after. Love makes the world go round, and it can help keep a senior’s depression under control. Show aging seniors that you love and need them, listen to them, and hug them often. Expressions of love are especially important for widowed seniors who need more support and affection to deal with grief. Decreases in appetite and behavioral changes can be a symptom of depression getting worse. Contact a mental health professional and sign the senior up for counseling if you suspect the disorder is getting out of hand. The therapist may recommend antidepressants, but in less serious cases, alternative medicine like aromatherapy or occupational therapy may be a better option. In case your depressed family member is using antidepressants, you should make sure they take medications regularly and obey doctor’s orders in terms of dosage, lifestyle and diet. You may also need to help manage medication. Remind them to take their daily dose and watch the medicine cabinet for signs of abuse or skipped doses. For senior family members aging in place, you can hire someone to check in on them once a day and help with day-to-day chores such as grocery shopping and bathing. Until I convinced my mother-in-law to move in with us, she’d been on full-time home care in San Francisco. Though it was a temporary solution, it made traveling over the holidays far less stressful knowing that she was in good hands. The post 10 Ways to Help Seniors Deal with Isolation and Depression appeared first on DailyCaring.